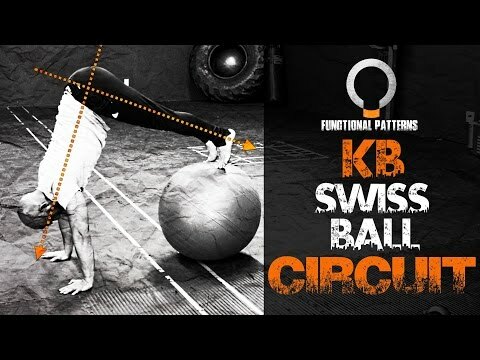 Here’s a Kettlebell and Swiss ball training circuit you can add to your functional training program. Be sure you do your Myofascial Release and Corrective exercises beforehand to promote better balance and longevity with your body. Sign up to our Newsletter and we’ll send you a Video Preview to our 10-Week Online Training Course! Hello, this is Naudi Aguilar at Functional Patterns. For today’s video, I’m going to show you some advanced core exercises with a Swiss ball and a kettlebell. For the first technique, I’m going to be using some gloves, [inaudible 00:00:18] because my hands tend to get a little bit sweaty, and it’s hard to maneuver the kettlebell when my palms are sweaty, in the way I’m going to do it right now. So, rather than normally setting the rack right here on our hands in this fashion, we’re kind of just letting the kettlebells hang on our wrists. What we’re going to do is actually hold it and stabilize it vertically in this position, like so. What I want you to do to get comfortable is kind of just start getting yourself used to maneuvering the kettlebell, balancing your shoulder out while you’re holding your spine neutral. Try learning to center yourself under that kettlebell and making it a nice and efficient press coming down and upward. I don’t want you to rely so much on your grip when you’re doing this. And again, like I told you guys before, the reason I’m using the gloves is because my palms do get sweaty, and sometimes that kettlebell can slide off to a side and it can be a little bit problematic. So, if are a person who that has sweaty palms like me, then maybe you will need some gloves to help you out with this. Once you get that technique somewhat mastered, what you’re then going to do is lay in a supine position on the Swiss ball like I am right now. I’m a smaller person, so typically I’m using a 55-centimeter ball. If you’re over six feet you’ll probably end up needing something at least 10 centimeters bigger. But for me, this is going to be about right. I want to be holding my core nice and neutral, opening up those ribcage muscles. That way I can incorporate some good transversus abdominis activity. I’m going to lower my slings in this fashion. You guys will see how I’m kind of reaching up with my right hand. As I pull down with my right hand I press up with my left hand. I can pronate as I come down, get a little bit of a neutral grip as I come back. It’s going to be really challenging all those core muscles if you do it correctly. Be wary of not going into a hyperextension, bridging your hips up like this. We’re creating a hyperextension right here in that lumbar spine and that pelvic region. Not necessarily going to be beneficial if you’re trying to improve your biomechanics in a way that would apply in reality through searching for efficiency. So be careful to not get your hips too high. We want to prevent that hyperextension. So the pelvis is right there in that neutral point. Then we do our work from there. Really try turning that T-spine as you go through your range of motion. Really try driving off your heels, balancing on your heels as you’re going through your repetitions. You should really be feeling your obliques kick in significantly. You might begin to feel your glutes work as well. Also, another thing, try and watch your neck not going forward as you’re laying on your back. Rest your head on the Swiss ball. Get yourself to about that point, so that way you’re not hanging off of it and pressing upward and tightening your SEMs. Not good if you end up doing that, could create lots of tension that wouldn’t necessarily be advantageous toward improving your biomechanics. Hey, so for the next techniques we’re going to do, I’ll actually get the gloves off because I don’t really need them anymore. Get the kettlebell out of the way. We’re going to go into a Swiss ball pike. Now, before we go into the pike I just want to break up a variable that many people miss in the sense that since they have hamstrings with limited hamstring mobility, that when they get to the top, they tend to get a round their lumbar spine in this fashion. What I want you guys to do when you go into this technique is you’re going to pull up in this fashion and begin to anteriorly tilt your pelvis until you get to the top. Then you come right back down in this fashion. Notice I’m not swaying my lumbar spine. I’m not kyphotically rounding or winging, kyphotically round in my T-spine or winging my scapulas. I’m keeping everything in control. I pull, anteriorly tilt as far as I can. And it may only be about two or three repetitions to get the core to line up. So in that context, we’re active in the core muscles while you’re in that hip flexion, really good for learning eccentric stability in your hamstrings. So really get that anterior tilt at the end of the concentric phase on this. Now, what we’re going to do is throw one more variation onto this exercise and we’re going to mix an abdominal extension along with the Swiss ball pike. I’ll show you guys what that looks like. So what we’re going to be doing, again, bringing my shin bones onto the ball. I’m going to roll back, now, in this fashion, pull myself up, follow the momentum, anteriorly tilt and bring myself back up. If you just focus on your mechanics, try perfecting them as much as you can. I’m really trying to focus on retracting my [inaudible 00:05:19] as far as I can and trying to anteriorly tilt my pelvis as far as I can without going into a lumbar hyperextension. If I do that with good technique without going back into my compensations, new neural connections are going to be made in the brain and it will be much more challenging on your body because you’re not activating muscles in a manner that you’re used to. If you focus on your technique before focusing on just trying to go through the repetitions, you will feel more of a challenge in that fashion. Now, again, because we’re introducing new signals in the brain. New signals lead to more challenges, and especially if we’re looking for efficiency. I’ll give you guys one more look at this exercise. Again, my shin bones on that Swiss ball. I fall back in this fashion, trying to hold a neutral spine here as you guys will see. I’m not dropping down like before. I’m trying hold as much as a neutral spine as possible coming back, coming up, anteriorly tilting, coming back down. All right. There are some core exercises that you can employ into your programming. Really tough if you focus on those small details that most people tend to overlook. Technique is one thing that you don’t really see pushed too often in the fitness industry. And looking at those small details will eventually lead … If you don’t focus on technique, the failure to look at those details could lead to some pretty bad stuff in the realm of pain and potential injury. So be sure that you really try tightening up your technique. I did my best that I could there. I still have deficiencies I’m trying to work out of my body, so please forgive me. I’m maybe not giving you the perfect representation of what I’m looking for but I did my best. I’m a work in progress just like all you guys. So, with that said, I’m still working on my myofascial release. I’m still working on my corrective exercises and my static stretches to help promote balance in my body. I highly recommend the same thing for you guys. This is a continually evolving practice. You’re constantly developing and you’re never going to achieve perfection. So we always got to aim for that direction even if we’ll never get there, just to ensure that we can last with our bodies and move stronger for a longer period of time. I hope you guys found this video to be informative. I will be putting out more videos here shortly. This is Naudi Aguilar with Functional Patterns, reminding you to train intentionally and not habitually. I’ll see you soon. I’ll have a kettlebell workout to share soon, but until then I’ll share my favorite stability ball circuit! Would like to know where the level 1 courses will be held this year. Thank you!